Why are Cavity Insulation Extractions needed? The main reason is due to damp issues. Damp and mould appear on the walls when the cavity insulation gets wet inside, breaking down the properties of insulation. This is due to porous brickwork, flooding, or burst pipes. Poorly insulated properties is another reason. A poor drilling pattern or installation at the wrong density can be a major factor of damp. Whatever the reason, the inefficiency means that heat is lost through the walls and causes you to use more heating/electricity as well as the health issues associated with damp. An easy extraction process will help regain your property to its original state. Using specialist tools and machinery, Vac-Xtract can extract defective cavity wall insulation, causing little disturbance to the fabric of the building or to the occupant of the home. We can make an extraction of, Fibre Wool, Foam and Bead Insulation products from the cavity walls of properties that need either upgrading of insulation or that are exposed to the effects of dampness or water penetration. 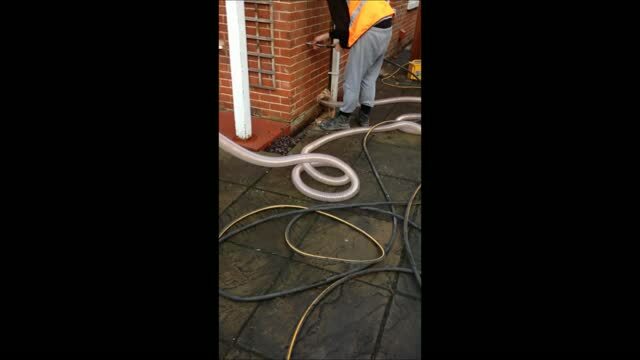 The cavity wall extraction process entails removing several bricks along the damp course and then the old insulation being removed using an industrial vacuum machine with compressed air which brings the defective material to the bottom. All waste will be removed from the property by Vac-Xtract. We have worked within the Cavity Wall Insulation Industry for over 15 years of Installing and removing both wall and loft insulation. Because of this experience, we feel we have the knowledge to deliver the best service there is within our field.